Do you have specific questions about how yoga can help you feel more comfortable in your body, more relaxed in your mind and more at peace in your heart? Do you want to develop a routine you can do at home? Are you looking to deepen your practice? Do you want a little yoga “primer” prior to joining a class? Do you simply want to receive more individualized attention to complement your home or class experiences? 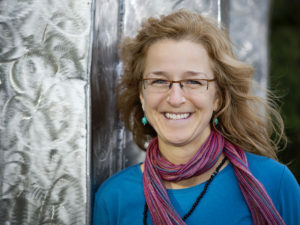 Jenn is now available to work with you one-on-one to help you explore your sadhana (personal practice). She is also available to work with small groups. Location, intention and fee are discussed on an individual basis. Students will experience the process of quieting the mind while engaging in conscious movements and mindful breathing. Experience the grace and serenity of linking the breath to movement, flowing from one pose to another in a meditative state of mind. Practitioners are encouraged to strengthen their muscles and concentration by holding various postures in a way that is inspiring, yet safe and pleasurable. Students can practice in a non-competitive environment where they are invited to gradually surrender to various postures: gently softening the joints and muscles and gradually steadying the mind. Classes are open to all levels. Instruction is individualized to meet the beginner as well as the experienced yogi’s abilities, interests and needs. Feeling simultaneously energized and relaxed, students re-enter their lives “off the mat” in a healthier state of mind, body and spirit. Don’t miss outdoor classes in the Green Garden at the Toledo Botanical Garden in the summertime! There are infinite modifications to the traditional yoga poses that can be explored to help honor the strengths and limitations of each individual. We use a chair as our main prop while exploring some of these modifications. Chair yoga is wonderful for all practitioners to create variety in their practice, for teachers to help with individualization, and for practitioners who need additional stability and support. As we age, pain and stiffness typically sets in. Due to this discomfort, it’s challenging to continue to exercise and participate in activities that require movement. Consequently, discomfort continues and may even intensify due to the lack of activity. Furthermore, depression can be a byproduct of inactivity and the negative cycle continues. Yoga is a gentle way to approach the body, mind and heart. Gentle movements are practiced to generate and maintain fluidity in the muscles and joints. Deep breathing exercises boost the immune system, relax the body and create a state of serenity in the mind. 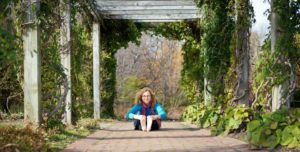 Stretch Yourself Over to the Toledo Botanical Garden: Relaxation. Flexibility. Serenity. Focus. Breathing fresh air. 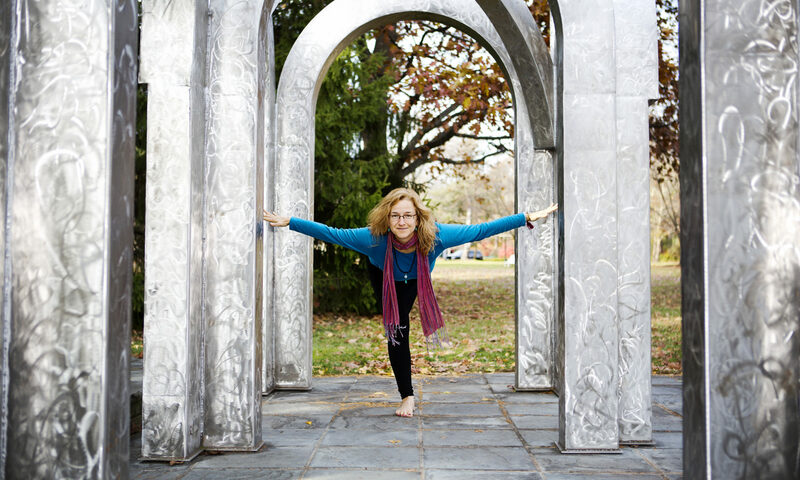 Throughout the summer, Jenn will be offering morning and evening Yoga sessions in the quiet splendor of the Green Garden, a semi-private space, located within the Perennial Garden. Start or refresh your yoga and meditation practice in this ideal setting. Take a “mini vacation” in the middle of the week, right here in Toledo, Ohio! Come out to the garden to begin your journey within. Classes meet on Tuesdays, 6:30-7:30 pm May 28 – September 24. Laughter is the best medicine! Laughter Yoga is the practice of combining laughter exercises with yogic breathing. The many benefits of laughter include: lowering the negative effects of stress, oxygenating the body and brain, and improving mood and overall health. The concept of Laughter Yoga is based on a scientific fact that the body cannot differentiate between fake and real laughter if done with willingness. One gets the same health benefits, whether laughter is real or simulated. It was started by a medical doctor, Dr. Madan Kataria, in India in 1995. 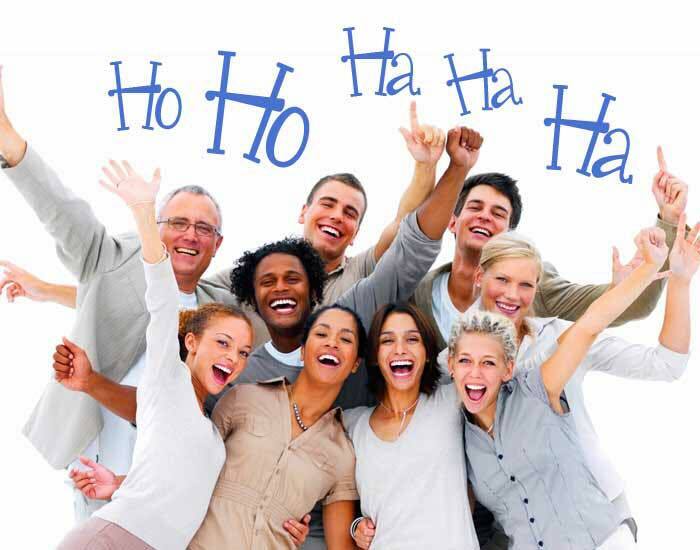 There are thousands of Laughter Clubs in more than 106 countries! Check out www.laughteryoga.org for more information. Learn and practice various meditation techniques which encourage focus, relaxation, and self-awareness. Discuss your experiences with meditation in a safe environment. Cultivate a home meditation practice that supports your presence of mind and alignment with intentions. Allow yourself to experience a refreshing midday break or a gentle transition from work to home by incorporating yoga into your work life. Hatha yoga is not simply exercise; it is meditation in motion and assists the practitioner in calming and focusing the mind by participating in rhythmic breathing while holding various postures. The practice assists the student in balancing out physical and mental stress by creating an opportunity to stretch and relax. When necessary, students can modify poses so they remain comfortable and are still able to breathe deeply. Some students choose to practice modified poses in chairs. Students learn ways to seek equanimity, or calmness in the mind regardless of the varying circumstances faced each day at work and elsewhere. Contact Jenn to discuss how she can be of assistance in your company or organization. Children are natural yogis: curious, flexible, and intuitive and always “in the moment”. Through movement children can explore the creative aspects and experience the meditative qualities of this ancient practice. 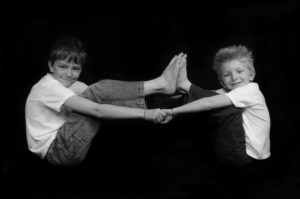 Students will be taught fun poses that are inspiring, invigorating and calming. They will also be led through guided meditations that promote relaxation, body and breath awareness, and stimulate the imagination. Children’s literature, music and opportunities for artistic expression will be woven into the class format. Plan some classes for your playgroup! 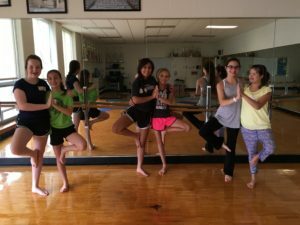 Jenn also leads Summer Yoga Camps at Maumee Valley Country Day School. 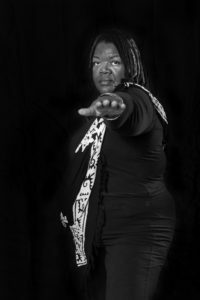 Jenn brings her skills as a former special education teacher and her gifts as a yoga instructor to those who can truly benefit from yoga: teens. Yoga and meditation can help develop concentration and provide an opportunity to relax and encourage a better sense of self through increased awareness of how the body and mind’s experiences are linked. Practicing yoga allows students the chance to take care of their bodies and to learn skills for handling stress in a non-competitive environment. The various postures are explored in a way to encourage respectful use of the body, complementing any sports involvement well. Stretching is a great way to prevent injuries and also can enhance performance. 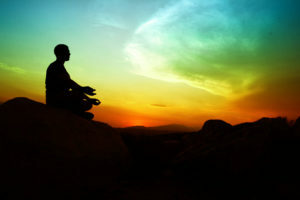 Meditating can assist with focus and attitude. Contact Jenn to find out how she can bring yoga to your high school or teen. 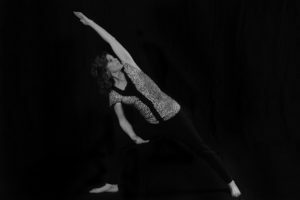 Jenn leads Summer Yoga Camps at St. Ursula Academy and Maumee Valley Country Day School. Taking care of one’s total health while pregnant is important not only for the mother-to-be, but also for the unborn baby. Practicing gentle stretches is helpful in finding comfort in the body during a phase of quick and dramatic change. Learning to calm the mind through deep breathing exercises, guided meditations and thoughtful movements assists the mother in establishing a sense of centeredness in the midst of ever-changing emotions and new and sometimes uncomfortable physical sensations. Yoga can enhance one’s awareness of self and help develop a sacred relationship with one’s baby as he or she grows inside. The benefits of increased mindfulness and breath control can assist women during labor, delivery and post-natal recovery. Expecting clients are invited to regular classes and modifications are suggested. A Yoga Birthday Party is a customized, private session with your friends/family in a location of your choosing. There is no maximum/minimum number of participants. 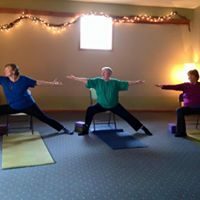 Once you have your guest list, we can discuss program options to meet the needs and interests of the group (considering levels of experience with yoga and meditation and any physical limitations). My intention is to help you host a party that allows party-goers to celebrate your special day in a unique, fun, healthy, and relaxing way. I will guide the group in gentle yoga stretches, practiced individually and with a partner. Throughout the experience, I will emphasize the power of the breath in staying focused and relaxed, even in awkward or challenging poses. I plan to finish with a deep relaxation exercise and heart-opening meditation. A few special touches will allow this to be a memorable experience for you and your guests, connecting in new and meaningful ways. Class length is one hour. Contact Jenn to schedule your party!